You are here: Home / Nu-Art News / Happy New Year from Nu-Art Graphics! Nu-Art Graphics would like to thank our many clients for a spectacular year! This past year has been one of growth and development fueled by new creative requests from many of our existing clients, as well as new design challenges from several new clients. One of the highlights of 2017 was the fact that Nu-Art Graphics celebrated its 40th year of business! That’s 40 years of producing high quality OEM graphics, industrial die-cut decals, front panel and custom graphic overlays, screen-printed decals and so much more. We also celebrated the first full year of having received our certification from the California Public Utilities Commission (CPUC) as a certified Women Business Enterprise! This has allowed us to expand our list of clients even further as outlined under the CPUC’s Utility Supplier Diversity Program. Many new designs were created by our skilled art department which were then turned into custom OEM instrument panels, screen-printed graphic overlays and pressure sensitive decals, just to name a few. Beyond the design process, we were also tasked with offering an alternate material and creating a more user-friendly custom polycarbonate overlay for a local company. Once the proof was approved we began production, adding yet another US made product to our catalog. Our president and lead members of the team here at Nu-Art also attended the SGIA Expo in New Orleans. The SGIA Expo provides educational seminars as well as a huge trade show which allows exhibitors to showcase their most innovative new technologies and products in the printing marketplace. Having attended the Expo, our team continues to maintain the most up-to-date knowledge so that we can continue to produce the highest quality products for you, our clients! We look forward to continued growth and success in the New Year. We welcome the opportunity to exceed your expectations and to surpass all of your new design and technological challenges. 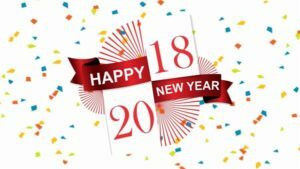 From all of us here at Nu-Art Graphics, we wish you a happy, healthy and successful 2018!